Veterans River Park, Main St. 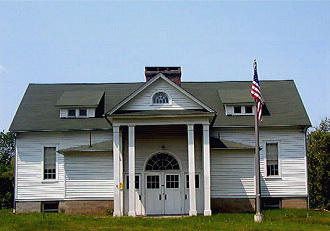 The Kirkwood Historical Society (KHS) was founded in the early 1980’s to research and preserve the history of Kirkwood, NY. One of the main purposes of the Kirkwood Historical Society is collecting and studying materials and artifacts, which will give us a greater understanding of Kirkwood's history. By disseminating information of the past it is hoped a greater interest in the present and hope for the future will be generated. The first slate of officers elected was in 1984. After meeting at several sites during its formative years, the Society is now permanently located in Kirkwood Schoolhouse #2 (Pictured Above), Main Street in Kirkwood Village. This building was vacant for years and in a sad state of disrepair. A massive community restoration program was put into action. Nearly eight years and thousands of hours later, the project was completed and ready for its new occupant. Since then, extensive efforts have gone into displaying and cataloging Kirkwood artifacts, pictures and records. The work is on-going. The Kirkwood Historical Society is constantly seeking new members. Active participation is encouraged though not required. Nor must one be a resident of Kirkwood for membership. The Kirkwood Historical Society is located in the beautifully remodeled, former Kirkwood Schoolhouse #2. It occupies 2 rooms on the main floor as well as a finished basement, known as The Community Room. In addition to KHS, Kirkwood Senior Citizens also meet in that room. One of the main floor rooms - formerly occupied by students of grades 1 through 3 has been nearly restored to original status. It features old school desks set up in classroom style. Many old school textbooks are in the room. A collection of some area high school yearbooks is also there. The other room - called "the big room" by most former classes because it was the classroom of "the big kids" (grades 4-6) has been transformed to the KHS Museum. Within its confines are scores of Kirkwood artifacts, books, pictures of all sorts, records and memorabilia. One recent gift was that of a majestically grand wooden desk. It was donated by Jean (Campbell) Smith, daughter of former Kirkwood Town Justice (of the Peace) Julian Campbell. To add to its intrigue is the fact that it once belonged to and was used by legendary early Kirkwood physician, Dr. William S. Beebe. Many elementary school students have never seen or been in a vintage 2-room schoolhouse. Realizing this, KHS gives tours of the museum including one of its classrooms nearly restored to its original state. Tours are available by appointment. Looking for a nice inexpensive gift for any occasion? KHS suggests a Gift Membership Certificate. Memberships are available in many categories: Patron- $1000 and above, Sponsor - $500 - $999, Donor - $100 - $499, Friend - $99 and under, Member - $5.